This was my first time baking a pie entirely from scratch. I never understood why anyone would want to bake pie from scratch. The store-bought, even the frozen heat-at-home pies were delicious to my taste buds. But a month ago when we went to the farmer’s market in Alabama, we purchased peaches that looked delicious but tasted too ripe. Rather than tossing them away, we froze some to put in smoothies and baked the rest in pies. Isn’t that the perfect fall thing to do? Make pies. Okay yeah. Baking homemade pies was too much work. And it took a long time. The pie crust needed to refrigerate over night. Then the rolling and carefully placing the crust in the pie dish. And after the torture of smelling the delicious pie bake in the oven, I had to wait a couple of hours for it to cool. But when I had that first slice, I knew exactly why people baked homemade pie. It was heaven. I’m the kind of person who eats pie mostly for the crust, not so much the filling. And this crust was perfect. It was flaky and not too dry. I used the Betty Crocker’s Cookbook for the filling. The crust, well, I didn’t have any margarine on hand so I used butter. 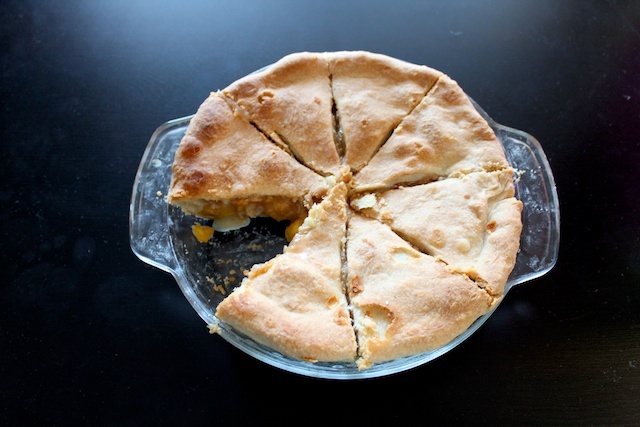 It’s a simple four ingredient recipe for pie crust. I doubled the crust recipe for the crust and the crust cover. Recipe below the picture. Double this recipe to make a full pie with cover. Mix flour and salt together in a large bowl. Cut the butter into small cubes and while it is still cold, mix it in with the dry mixture. Use a pastry blender or a potato masher to help cut the butter into the dry mix. The result should look like course crumbs. Add ice-cold water into the mixture a tablespoon at a time. Mix until the dough forms a ball. Cover in plastic wrap and allow to refrigerate overnight or for at least 5 hours. If you doubled the recipe, split the dough in half for the crust and cover. Roll the two separate dough into balls. Sprinkle flour on the counter and roll the dough flat to cover the pie dish and the top of the pie. Follow pie baking instructions that usually comes with the pie filling recipe. 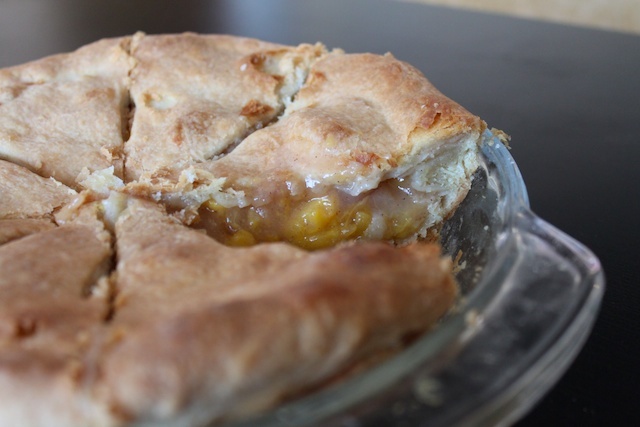 I have a very similar pie crust recipe, however it doesn’t have to be refrigerated…. it’s super easy and sooo amazing. I too am a crust kind of girl. mix butter and olive oil together then add flour with pastry cutter. Add ice water as needed. oh awesome! thanks for sharing that recipe with me. i will have to try that next time. Your pie looks amazing! I’ve never made a butter crust- just usually a shortening one. I’ll have to try this. 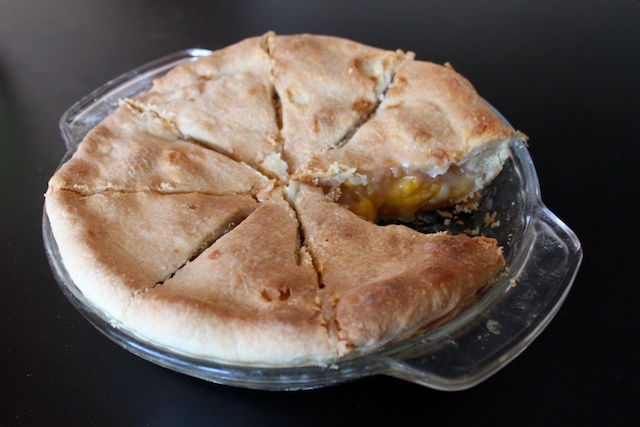 The first crust I ever made was a butter pie crust. It was years before I even wanted to try another one. None could complete. I’m, unfortunately, a pie crust snob, so I could never understand why anyone would even want to buy a store bought pie crust – they were so dry and flavorless. But hats off to you for trying your first homemade pie crust! I think the time in making it will get shorter as you get more practice. I’ve never had to refrigerate mine. Using a pastry cutter helps keep the dough cold. You might even try chilling your flour in the fridge first to give you an edge. Great job, Tiffany! I was taught how to make my own pie crust by a sweet old lady who lived in the same condo I did when I first got married. And I’ve been baking them ever since. Sarah Lee is right – the assembly time will get shorter. The fact your first pie turned out so well the first time is proof positive you’ve got the makings of “Pie-snobdom!” Believe me, I’ve tried teaching people how to make pie crust and you either have it or you don’t. You’re sure to get better.